Leafy greens including kale, spinach, arugula, and chard are the undeniable superstars of the food world. Low in calories, yet high in fiber, vitamins, and phytonutrients, greens are incredible for your health in more ways than you would even suspect. Whether in whole food form, smoothies, or organic greens powders, greens have the power to make you look and feel younger, and can even extend your lifespan! 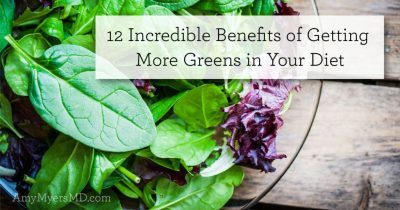 If you still need convincing, read on to learn about all the amazing benefits of getting more greens in your diet. Want to stay mentally sharp as you enter your golden years? Eat your greens! 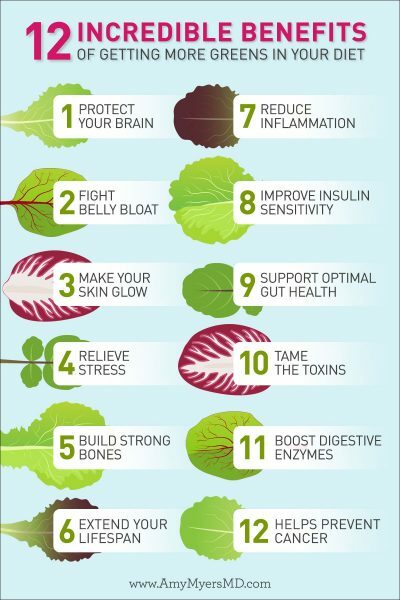 A recent study published in Neurology found that those who ate the most leafy greens each day had slower rates of cognitive decline compared to those who ate the least.1 In fact, the greens-eaters had the memory equivalent of someone 11 years younger! This was even true after adjusting for other factors including lifestyle, education, and overall health. Are you looking to live as long as possible (who isn’t)? Forget biohacking–the fountain of youth could be found at your local juice bar! That’s because greens have the power to delay the shortening of telomeres, the protective caps on our DNA that shorten with age.10 Once its telomeres are completely gone, the cell dies. The rate of telomere shortening can be increased or decreased based on lifestyle factors including exercise, diet, environmental toxins, stress, and smoking. Broccoli sprouts in particular seem to have a superb ability to preserve telomere length. Eating a serving of leafy greens with every meal can help prevent or regulate diabetes by improving insulin sensitivity and lowering blood glucose levels. Even just including a little over one extra serving of greens daily can reduce your risk of diabetes by 14%!12 Not to mention, if you have a thyroid condition, dramatic swings in blood sugar encourage your body to convert more T4 to Reverse T3, the inactive form of thyroid hormone. This slows down all of your metabolic processes and can exacerbate thyroid hair loss. Greens can help temper blood sugar spikes and reduce thyroid dysfunction flare-ups. While it’s ideal to get these incredible benefits from real whole foods, not all of these foods are commonly available, in season, or grown in optimal soil, and it can be difficult to get enough of them from diet alone. That’s why an organic greens powder is a great option to have on hand for when you’re just too busy to prep a big salad or smoothie, or when you’re looking to stay healthy while on-the-go or traveling. One scoop of my Clean Greens™ Superfood Juice Powder is a nutritional powerhouse, containing 14 USDA certified organic plant foods, including green superstars spinach, kale, alfalfa, moringa, and broccoli sprouts. It’s an easy and convenient way to ensure you’re getting your daily greens along with all the disease-fighting, anti-aging, and immune-boosting benefits that they provide!